The pericardium is a double-walled sac in which the heart and the roots of the great vessels are contained (Figure 1). The pericardial sac encloses the pericardial cavity which contains pericardial fluid. Numerous conditions may cause inflammation in the pericardium, the pericardial cavity and/or the myocardium. Pericarditis refers to inflammation of the pericardium, and myocarditis refers to inflammation of the myocardial (muscle) tissue. However, it is often difficult to differentiate pericarditis and myocarditis, and they tend to accompany each other. Therefore, the term perimyocarditis is often used in clinical practice (this article will use all three terms interchangeably). The etiology, clinical characteristics and ECG features of pericarditis will be discussed here. From a clinical point of view, clinicians must be able to separate pericarditis from ST elevation myocardial infarction (STEMI). This may not always be simple, because both conditions bring about severe chest pain and ST elevations on the ECG. However, as we will discuss below, it is actually rather straightforward to distinguish these two conditions. Figure 1. 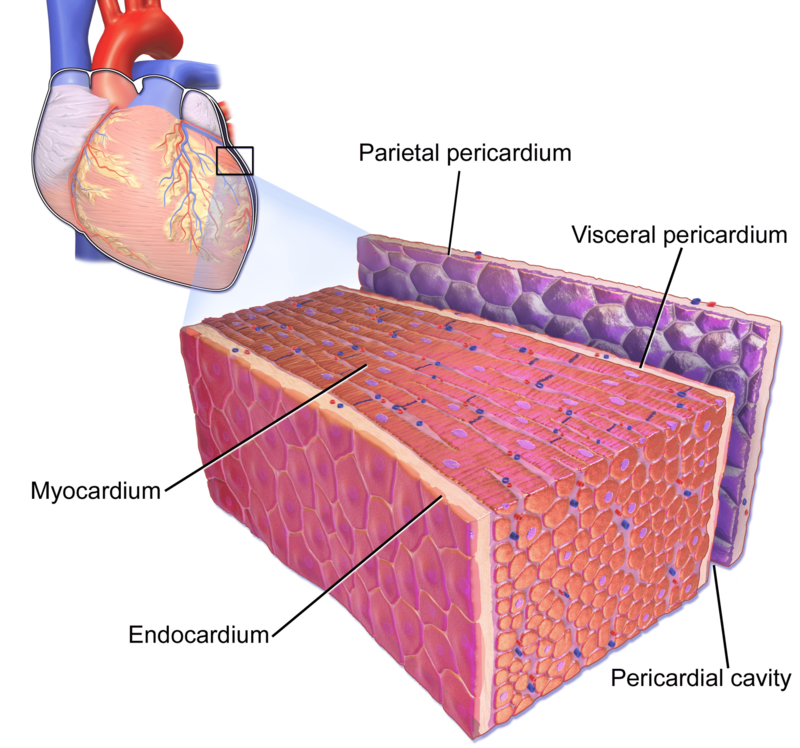 The pericardial sac and the myocardium. Note that pericarditis (inflammation of the pericardial sac) is difficult to discern from myocarditis (inflammation of the myocardial tissue) and because they tend to accompany each other, the term perimyocarditis is often used. Image by Bruce Blausen, Blausen Gallery 2014. Post cardiac surgery (hemorrhagic pericarditis). There are two forms of pericarditis: acute and chronic. This article will focus on the former, as it has implications for all clinicians and the ECG. Acute pericarditis causes chest pain, which may be very difficult to discern from pain caused by acute myocardial infarction. The chest pain in acute pericarditis may be severe and the patient may also experience cold sweats, tachycardia and anxiety; all of which are common in acute myocardial infarction. Clinical examination may reveal pericardial friction rub and the echocardiogram may show increased fluid in the pericardial cavity (pericardial effusion). Hemodynamic compromise may occur if accumulation of fluid in the pericardial sac compromises the relaxation and/or contraction of the ventricles and atria. This situation is referred to as cardiac tamponade, which has been discussed earlier. The retrosternal chest pain caused by acute pericarditis may be very similar to that seen in patients with STEMI. Moreover, the pain in acute pericarditis may also, as in STEMI, radiate to the neck, shoulders or back. However, acute pericarditis is more likely if inspiration and supine position worsens the chest pain, and sitting upright and leaning forward alleviates the chest pain; the pain in STEMI is unaffected by position. Nevertheless, the retrosternal chest pain in acute pericarditis is very similar to that in STEMI. The combination of retrosternal chest pain and ST elevation on ECG explains why clinicians often confuse acute pericarditis and STEMI. This is further complicated by the fact that acute myocarditis may cause elevated troponin levels (myocardial cells may die as a result of inflammation). Acute pericarditis tends to affect younger individuals. The most common cause of pericarditis is infections, which is why many patients may report symptoms consistent with viral infections (particularly in the preceding days). The ECG is highly effective in differentiating pericarditis from STEMI. Figure 2 displays an example of perimyocarditis. 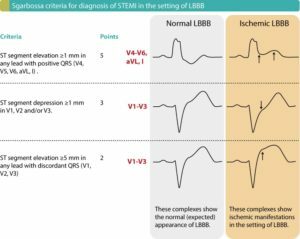 ECG features are discussed below. Figure 2. 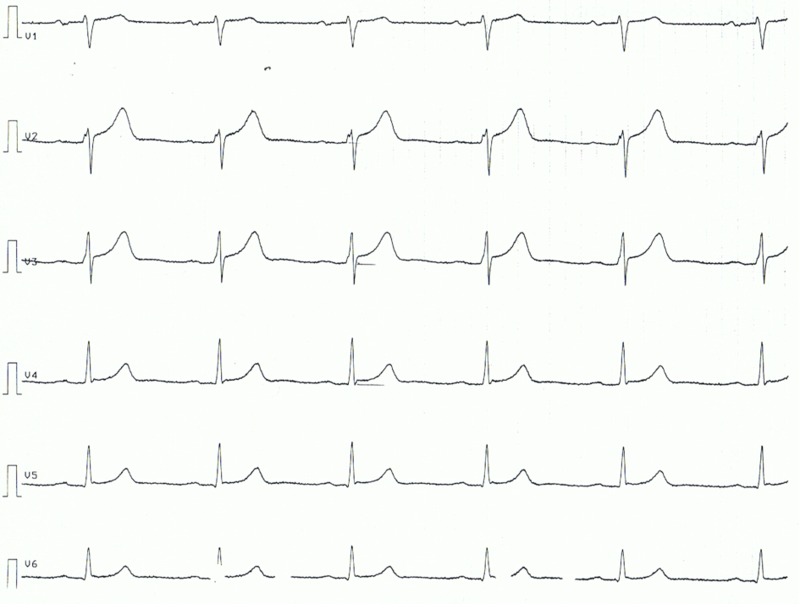 The ECG in acute pericarditis (myocarditis, perimyocarditis). As evident there are generalized ST segment elevations. 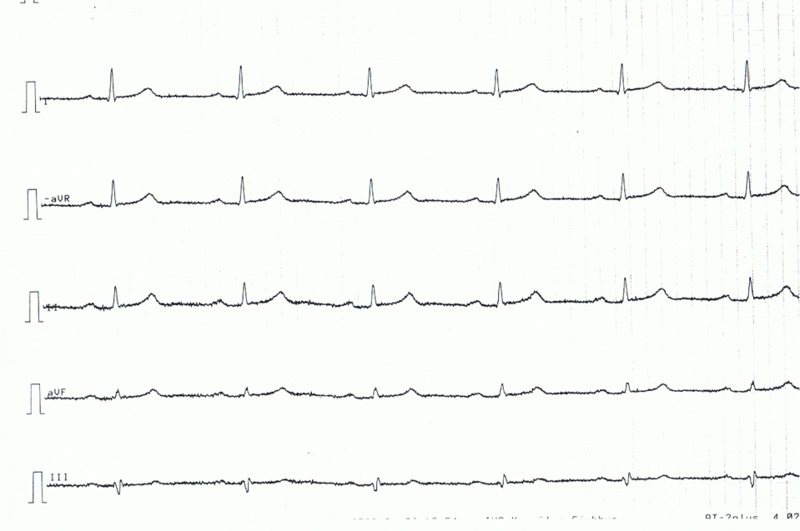 There are no reciprocal ST segment depressions and no simultaneous T-wave inversions (negative T-waves). The ECG is used to diagnose acute pericarditis. One must always rule out the most serious differential diagnosis, which is ST elevation myocardial infarction (STEM). 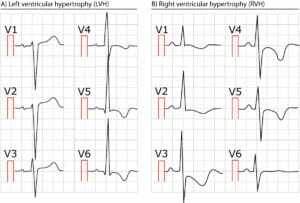 In order to provide the reader with knowledge on this matter, we will now discuss the characteristics of all ECG changes seen in acute pericarditis, and contrast them to ECG changes seen in STEMI. ST elevations in acute pericarditis are generalized, which implies that they occur in most ECG leads (both limb leads and chest leads). Indeed, whenever a patient presents with chest pain and generalized ST elevations, one must always suspect acute pericarditis. Lead V1 is typically spared from ST elevation (i.e lead V1 does usually not show any ST elevation). The ST segment is typically concave (read about ST segment elevations). There may be a notch in the J-point (which can be seen in leads V4 and V5 in Figure 2). The magnitude of the ST elevation is typically <4 mm high. There are no reciprocal ST depressions. ST elevations and T-wave inversions do not occur simultaneously. ECG changes in pericarditis are rather static and changes slowly over the course of several days to weeks. ST elevation myocardial infarction (STEMI) causes localized ST elevations, meaning that there are ST elevations in a few leads which are anatomically neighbouring (so called contiguous leads). For example, inferior STEMI causes ST elevations in leads II, III and aVF. The ST segment is typically straight or convex (read about ST segment elevations). Reciprocal ST segment depressions are very typical of STEMI. ST elevations and T-wave inversions may occur simultaneously in STEMI. The magnitude of the ST elevation may be considerably higher than 4 mm. ECG changes are dynamic in STEMI. For example development of pathological Q-waves, changes in the magnitude of the ST elevation, T-wave inversion etc, may change within minutes to hours. Note, however, that in some (rare) cases of acute myocarditis, ST elevations may be localized. This results in a situation in which it is very difficult to rule out STEMI on basis of the ECG. ST elevations are normalized slowly in pericarditis. It may take weeks for the ST elevations to resolve. Thereafter, T-wave inversion typically ensues. The T-wave inversion may be discrete and lasts for one month. As mentioned above, ST elevations and T-wave inversions do not occur simultaneously in pericarditis. More: Inverted (negative) T-waves. The PR segment is not affected in STEMI, whereas acute pericarditis often causes PR segment depression. Such depressions occur in most leads, except from lead V1, which often shows PR segment elevation. Elevated troponins are common in acute pericarditis. M. Imazio et al (Cardiac troponin I in acute pericarditis; JACC 2003) showed that one third of patients had troponin elevations; in total, 8% had significantly elevated troponin levels. However, there was no association between troponin level and survival. 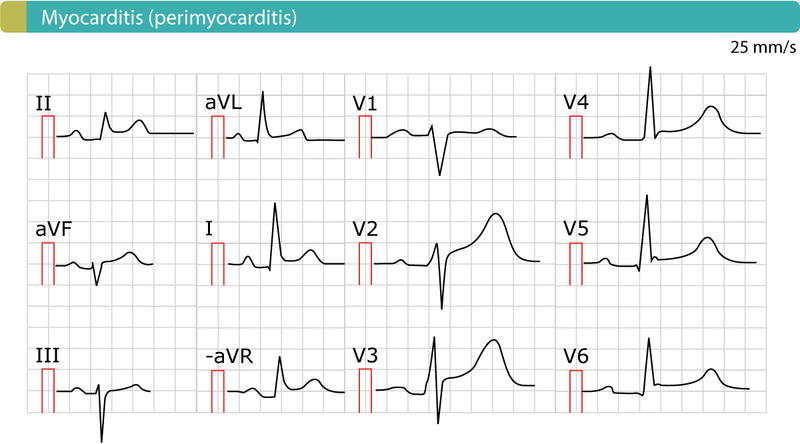 Below follows an ECG example of a patient with acute pericarditis. Note that the ECG changes are rather subtle. Figure 3. Chest leads of patient with acute pericarditis. Note the ST segment elevations, concave ST segments. Figure 4. Limb leads of patient with acute pericarditis. Note the very discrete, but generalized, ST segment elevations, concave ST segments.